I love a good pumpkin muffin around fall, don’t get me wrong, but last week I decided to take a great muffin recipe and shake it up with other fall flavours instead! Pear is a subtle, but oh-so-delicious, flavour that pairs beautifully with the cherry-like aroma of toasted almonds and the herbaceous, floral flavour of lavender. These are absolutely delicious hot out of the oven and make a great on-the-go breakfast. Not to mention how sparkly and pretty they look with their crust of granulated sugar on the top. 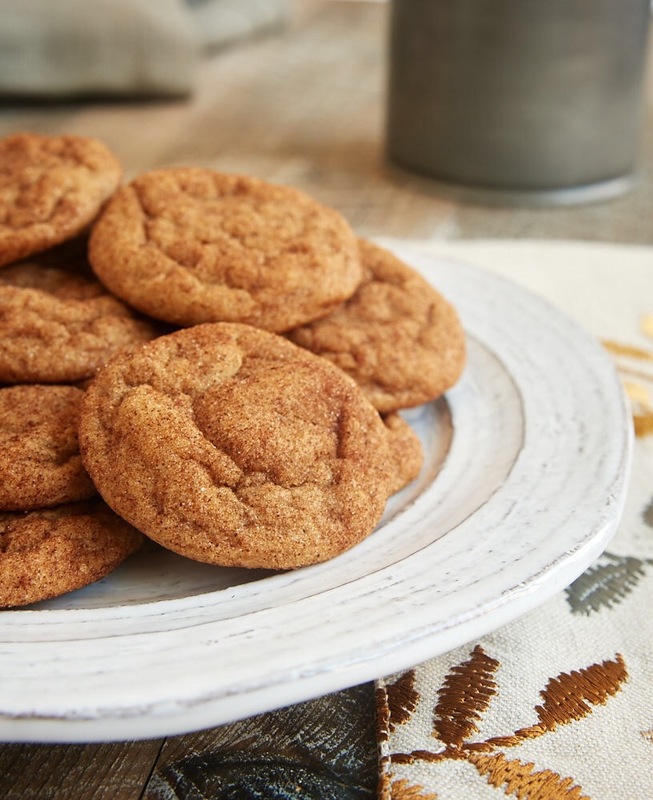 For a sweet fall treat that doesn’t centre around pumpkin or cinnamon, look no further! 1 // Preheat oven to 375 degrees and line muffin tin with cupcake foils or grease with a bit of butter or cooking oil. 2 // Mix the dry ingredients together (apart from the sugar) in a large mixing bowl until well blended. 3 // In a medium sized bowl, used an electric mixer or fork to cream the butter, sugar, honey and extracts together until they have the consistency of fluffy snow. 4 // Add your eggs to the butter and sugar mixture and beat until light and creamy. 5 // Gradually your dry mixture to your creamed butter, eggs and sugar. Add your mix and mix with a spoon. The batter should be a little bit lumpy. 6 // Open your canned pears, drain them, and chop them into 1/4″ pieces. Mix them into your batter until they are evenly distributed. 7 // Scoop your batter into your muffin tin – each cup should be 3/4 full so they have enough space to rise while they are baking. 8 // Sprinkle the tops of your muffins with extra granulated sugar to create a delicious, sugary crust. 9 // Bake for approximately 30 minutes. Remove from the over, let them cool and enjoy! These are truly the coziest fall treat and are the perfect accompaniment to a hot cup of coffee or fragrant mug of tea. A little butter really makes these flavours sing, so don’t be afraid to use the real thing (let’s face it, margarine never made anything better). Let me know what you think about this recipe! If you love lavender and like your desserts on the floral and not-too-sweet side, I have a feeling this will be a hit with you. As we are getting into fall, you would think I would be craving cozy meals like soup, stew or chili. While I love a comfort meal on a brisk autumn day, ice-cream is season-less and this strawberry ice-cream has my mouth watering whether it’s breakfast, lunch or dinner. Here’s how to make it! 1 // First things first, cut off the stems of your berries and chop them up into small cubes (approx. 1/4 inch pieces). They don’t have to be exact, just small enough so that they are easily mashed and don’t appear as giant chunks in your ice-cream. 2 // Use a fork or potato masher to mash your berries into a jam-like consistency. They should be soupy so that the strawberry juice is able to effectively flavour your milk and cream. 3 // Measure out your milk and cream into a large bowl and add your strawberries to the mixture. Whisk until the berries are completely incorporated into the base of your ice-cream. 4 // Add the sugar, food colouring and vanilla to your ice-cream mixture and whisk for four minutes or until completely blended. The milk should be a little bit frothy at this point. For those who are weary of sugar, feel free to experiment with other natural sweeteners. The flavour won’t be exactly the same, but the strawberries and vanilla really are the stars of the show, so don’t be afraid to play and adjust the sweetness to your taste. I just find that the cup and a half of sugar really make the flavour of the berries pop. 5 // Pour your ice-cream mixture into your machine and freeze according to the manufacturer’s instructions. 6 // Once frozen, either serve or store in an airtight container if you would prefer your ice-cream to have a firmer consistency. It has a soft-serve texture when it’s fresh out of the ice-cream machine. Freezing it for a few more hours (or better yet, over night) gives it a texture that is more like the traditional ice-cream we are all used to. 7 // Enjoy! It has a fresh berry flavour that is a little more tart than store-bought versions. It pairs well with a touch of coconut whipped cream, berry compote, chocolate syrup and/or desiccated coconut. There are so many amazing desserts out there that it’s hard for me to pick a favorite, but if I had to choose, I would have to pick chocolate chip cookies. Let’s face it, it’s hard to beat this comforting classic. Unless, of course, you not only pack them full of extra chocolate chips, but also white chocolate and butterscotch chips! This recipe is what chocolate/caramel dreams are made of. They are chewy and soft and are jam packed with chocolate goodness. They are also incredibly easy to make. Even if you’re a total baking novice, you’ll be able to whip these up in no time without a problem! So go ahead. Pour yourself a glass of milk (or merlot), preheat that oven and get to baking! These are seriously too good to not make. 1 // Preheat your oven to 350 degrees. 2 // Measure our your flour, baking soda, and salt and mix together in large bowl. 3 // In a separate bowl, cream the butter (or coconut oil) with the sugar. Add the eggs, caramel extract and vanilla and mix well, either with a fork (it’s a workout) or an electric mixer. Beat until the mixture looks fluffy or like snow. 4 // Add your dry ingredients to your butter and sugar mixture and mix thoroughly. Slowly add the chocolate and butterscotch chips and combine until they are distributed through the dough. 5 // Use an ice cream scoop to spoon out balls of dough and place them about 2 inches apart on a greased baking tray or a baking sheet lined with waxed parchment paper. 6 // Bake the cookies for approximately ten minutes. The cookies should be golden and crispy around the edges but soft in the centre. 7 // Cool the cookies before transferring them to an airtight container where they will keep for about 1 week. If you try making these cookies, let me know what you think of them! They are definitely decadent and are truly a chocoholic’s dream. I, like most normal human beings, love indulging in a frosty bowl of ice cream. Unfortunately it has been harder for me to enjoy my favorite treat as I have recently become a vegetarian and I’ve learned about all of the horrors that animals endure within the dairy industry. While there are quite a few great vegan ice cream brands and shops out there, I took it upon myself to create my own version – one that is healthy, delicious and free of sketchy preservatives. This recipe is ridiculously easy. Seriously, it requires 9 ingredients and you don’t even need an ice cream maker. It also has the creamiest most decadent texture that is pretty much identical to the real thing. I chose to make mint chocolate chip ice cream because it’s my favorite, but you could totally customize this depending on your tastes. For example, you could swap out the banana for strawberry, add more vanilla and forgo the mint to make classic strawberries and cream! The options are endless and oh-so delicious. 1 // Measure out all of your ingredients apart from the chocolate chips, vanilla and mint extract, and food colouring. 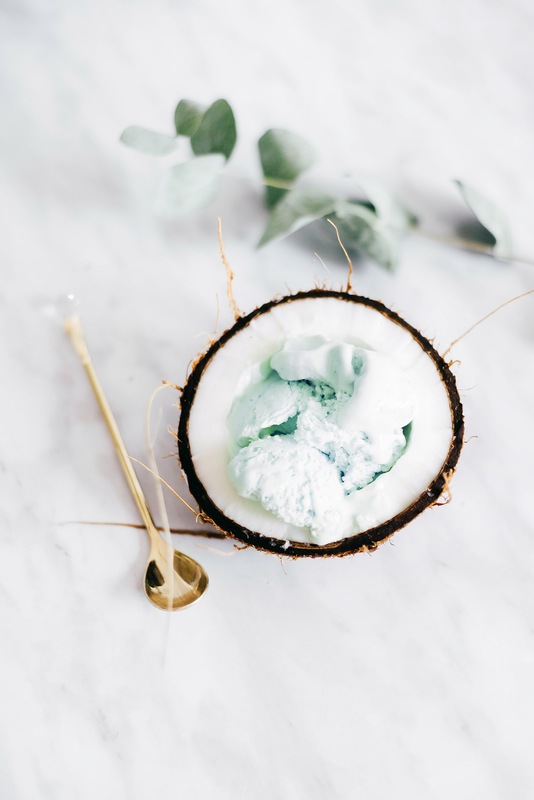 2 // Blend the avocado, banana, coconut cream, coconut milk, stevia and matcha powder until the consistency is rich and creamy – the avocado should make the consistency similar to whipped cream. 3 // Pour the contents of the blender into a mixing bowl and add the extracts, food colouring and chocolate chips. Stir until the ice cream is a pale mint colour and the chocolate chips are evenly distributed. 4 // Pour the ice cream mixture into a freeze-safe container and freeze it uncovered for 6 hours. The ice cream should be firm but easy to scoop. 5 // Scoop, top with sprinkles, shredded coconut, chocolate flakes or whatever you feel like. Enjoy your cruelty/dairy/guilt free frozen treat! I hope you enjoyed this recipe! If you give this a try, let me know how it turns out! There are few instances when I don’t feel like having a glass of red wine. And with evidence proving that wine is loaded with cancer preventing antioxidants and can even prevent heart disease and obesity (provided that one doesn’t over indulge), we all have even more reason to kick back with a decadent, relaxing glass of vin, with an occasion or without one. While it is nothing new to use wine in one’s cooking, I have come across a few recipes that have infused the drink into baked goods and unexpected desserts. I love baking, especially with unusual ingredients (floral waters, liqueurs and herbs take traditional flavors and desserts to the next level, like with my rosewater blondies) and these red wine infused treats have me intrigued. Truffle making is a fun but time consuming endeavor. 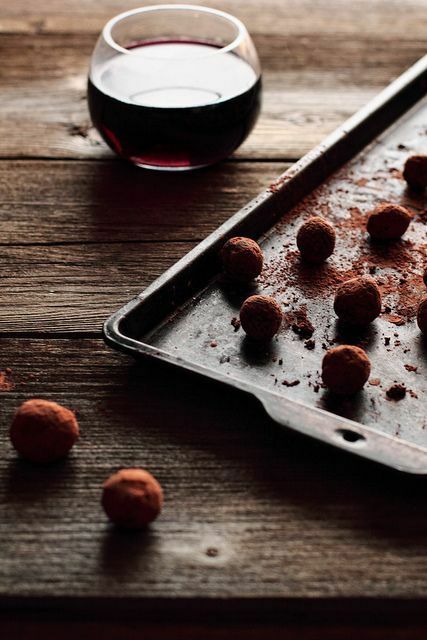 I love playing with different flavor combinations (the banana white chocolate truffles I made last Christmas were really good) and there is something about the combination of velvety dark chocolate and rich red wine that is so elegant and decadent. 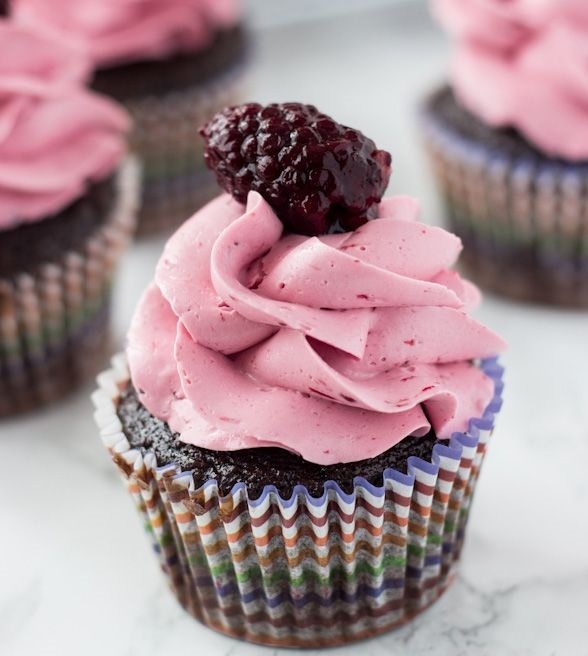 Cupcakes are a classic and nostalgic dessert that takes minutes to prepare and evokes all kinds of fun childhood memories. Simply add a little bit of wine into the batter for a much more grown up, sophisticated take on this traditional bake sale treat. 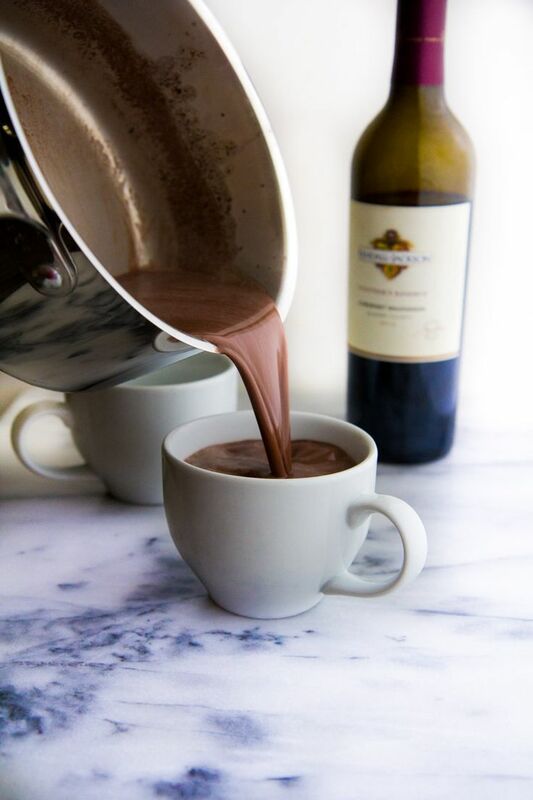 Is there anything better on a brisk Fall day than a creamy cup of hot chocolate? Maybe one with a kick of wine and spice. An adult take on the most comforting of all cold weather treats.